the Fairy Garden” from Mother Goose. It was a lullaby. The final piece was “Berceuse and Finale” from The Firebird. This piece was brilliant. We left the Concert Hall, and went to the GPO. When we went inside there were two historians who told us facts about the history of the GPO. The Post Office gave us some school utensils, and took a class photo. 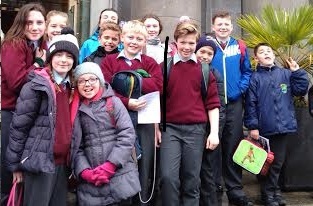 Then we left the GPO, and we were surprised to hear our teacher say we were going to Mc Donalds. Everyone bought their choice of food, and we enjoyed our meal. After, we headed back to school. over the castle. When he took over the castle, mysteriously a carving in the wall disappeared. No one knew why it did, but when the Talbots took back the castle it came back again.We went into the hall. There was a picture of Rose Talbot. The picture was ninety -two years old. Jane said if you keep your eyes on her eyes she will follow you. When we went into Mylo Talbot's room we saw an arc. Jane said the children in the castle were only allowed play with it on a Sunday. In the Great Hall we saw a picture of the Battle of the Boyne. There was a door in the hall. This was said to be owned by a ghost called Puck. After all that we got a hot chocolate and a flake in the café. We went home at two o clock on the bus. We had a lovely day. St Andrew’s annual Christmas fair to raise funds for the school took place on 29/11/15 in the school hall. It was on straight after 11:30 mass in the nearby church. There were lots of stalls including cakes, crafts, books, plants decorations and Christmas Cards, bric-a-brac and tombola. Other activities included the very popular Santa’s Grotto, face painting and balloon modelling. There was a raffle with lots of prizes.Tea, coffee, hot chocolate and hot dogs were also available and enjoyed by many. Our Christmas fair is one of the highlights on the school calendar every year. It is usually held on the last Sunday of November. It always begins with a special mass that the children can participate in by reading prayers and presenting gifts and also singing in our school choir. that we each produce a Christmas picture for.It is a great event and I am looking forward to next years Christmas fair already!!!! find a country to live in. This was to symbolise the parallel with Mary and Joseph in the Nativity trying to find a place to stay. One of the pupils spoke about how life is for the Syrian children since the war has started. very good, and the singing was amazing. I really loved it. My friends, sister and I did a play based on baby Jesus. The play was a musical. We all had a part. There were three kings, three shepherds, King Herod, Caesar Augustus, the Roman soliders, Mary, Joseph, the angels, Jesus and two narrators. Everyone had a line and we all sang our lines. My part was a King and I made my own crown. My mum made my outfit. 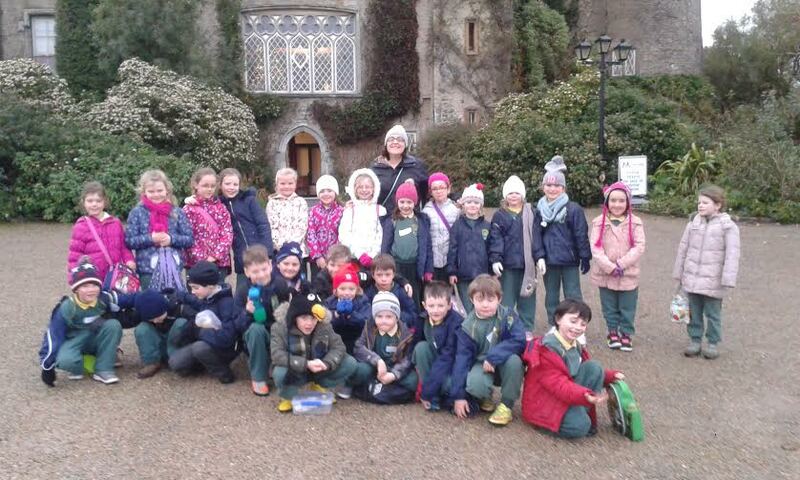 1st class and 2nd class took part in the play. The teacher who helped us was Ms Ronan. She did a great job and we all loved our parts. We all had a great time and lots of fun.